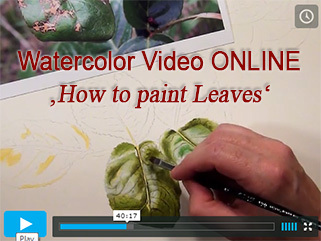 This DVD /Online Video concentrates only on painting leaves. I show you how to paint lively greens and also fall colours to create wonderful leaves for your paintings. 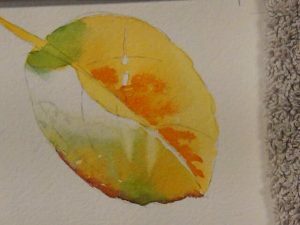 Learn to paint realistic leaves, painterly leaves, rich green leaves or a beautiful autumn leaf which has changed its colours from green to yellow/orange. My watercolor painting instruction are the perfect tool for you to learn in your own comfort zone. painting realistic and also painterly leaves. 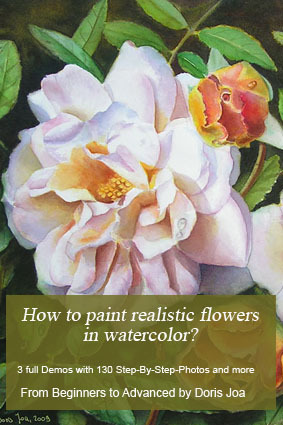 My Watercolor Painting Instruction shows you how to paint leaves on roses and flowers. 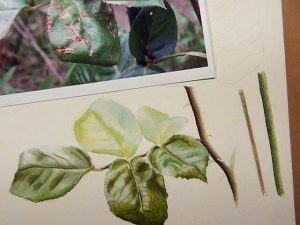 Although I love to paint leaves in watercolor on rose and flower paintings I have figured out that they are often the most with which we struggle with when it comes to paint them. We put all the energy into the flower so that it glows, is gentle and soft – because it is the focal point of our painting. But we often forget to give the same attention to the surrounding leaves of the flowers. Leaves do support our flowers, they give dimension to the painting and background and we recognize already the flower when we only can see the leaf. We know the leaves and we are aware about them and we don’t want to miss them. We want rich green leaves, light yellow leaves, autumn leaves, spring leaves, blue leaves, red leaves. 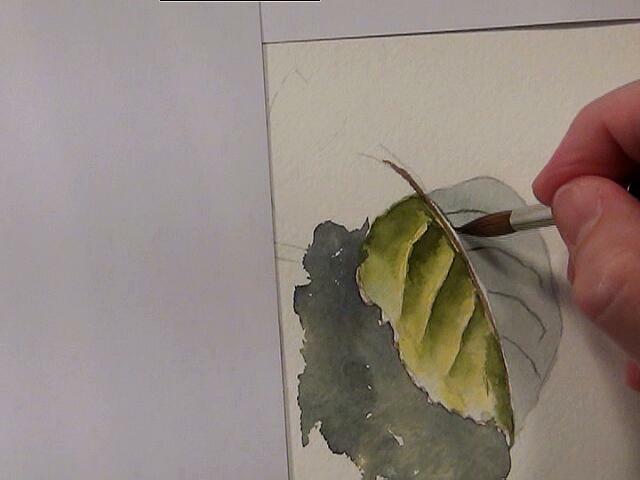 I show you how to paint leaves in these watercolor lessons. 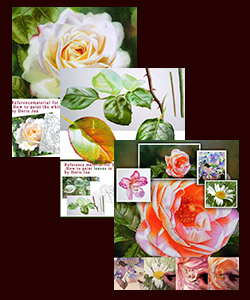 Just have a look in to my Rose Paintings Gallery or Flower Paintings Gallery and you can easily see how wonderful supportive the leaves around the roses and flowers are. With this Watercolor Painting Instruction DVD or Video Online Lesson you too can now create wonderful realistic and painterly leaves. I show you how with my Watercolor Techniques and indepth Instruction how to create the form of leaves, how to see the highlights and shadow areas and how to describe them with colour. 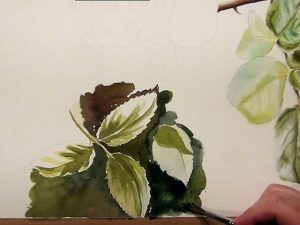 Learn to paint deep green leaves, fall leaves, painterly leaves, realistic leaves on flowers and roses using my easy to follow Watercolor Technique. 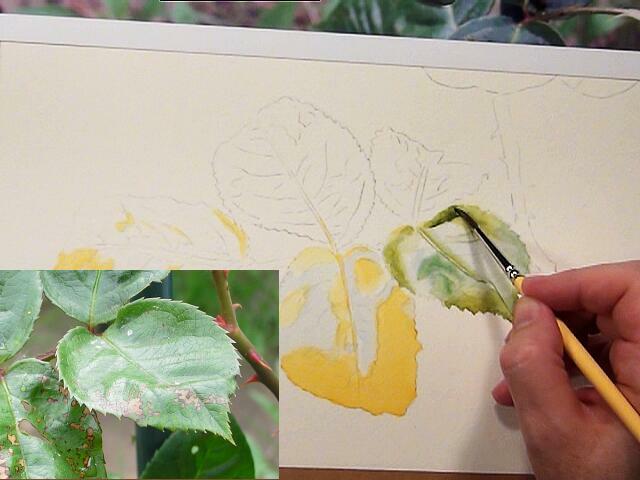 Learn how to mix the colours you need to paint stunning leaves. 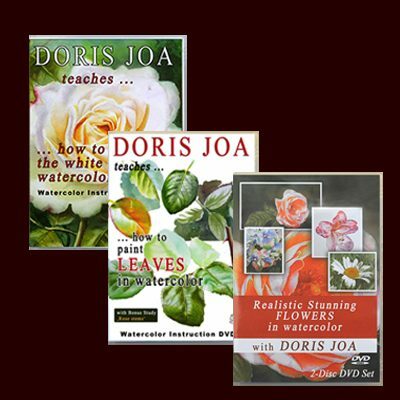 In this Watercolor Instruction DVD ‘How to paint leaves ‘ Doris shows you how to paint realistic looking leaves in watercolor on flowers and roses with details. She teaches you all you need to know to create stunning leaves using her easy to follow Watercolor Technique. You will learn how to mix the different greens: cool greens, warm greens, spring greens, blue greens and the shadow colours. Learn also to see and to paint the highlights and shadow areas. This knowledge helps you to create stunning leaves in watercolor and especially if you want to make a leaf the star in your painting. Learn to paint realistic leaves in watercolor with details, learn to create the form of the leaves with warm and cool colours, lights and darks. 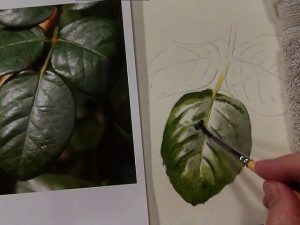 In this Painting Instruction is all you need to know to paint stunning leaves in watercolor in your flower paintings. Or maybe you want to do just a painting about leaves? Learn with me. 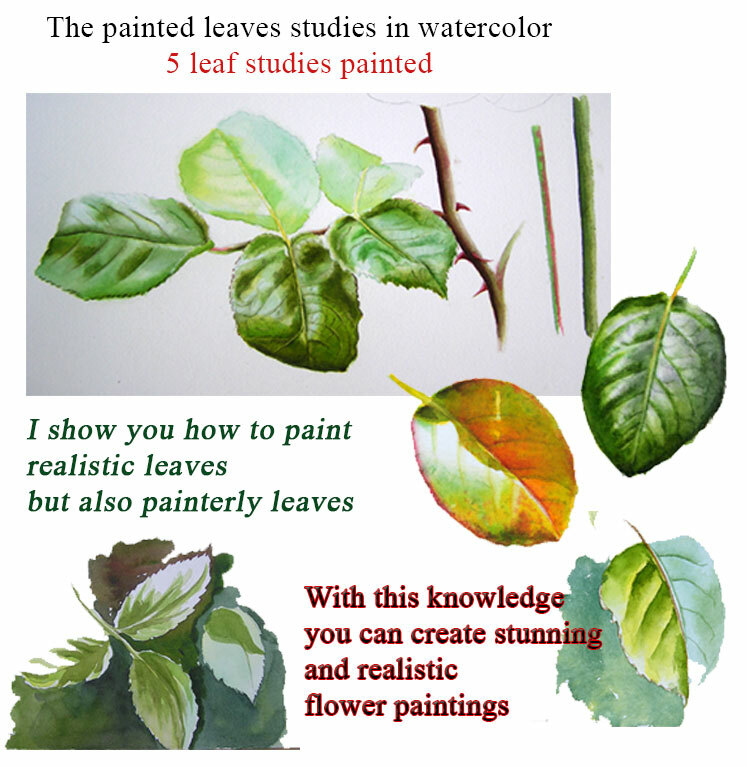 I also teach you how to paint leaves in a loose painterly style. Often in a painting we don’t need realistic looking leaves with a lot of details. 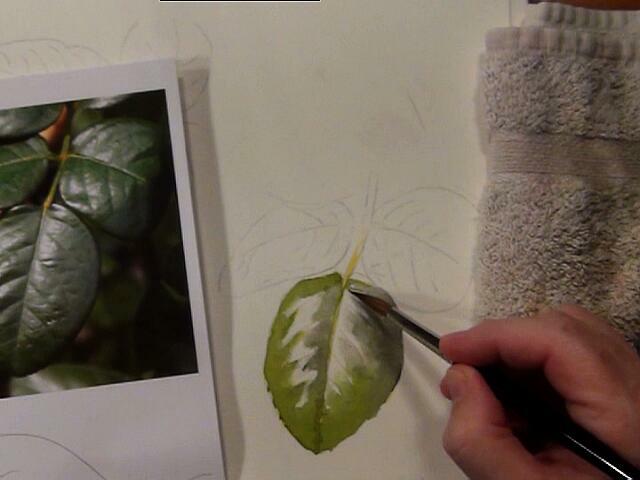 And this is why it is important to be able to also paint painterly leaves. 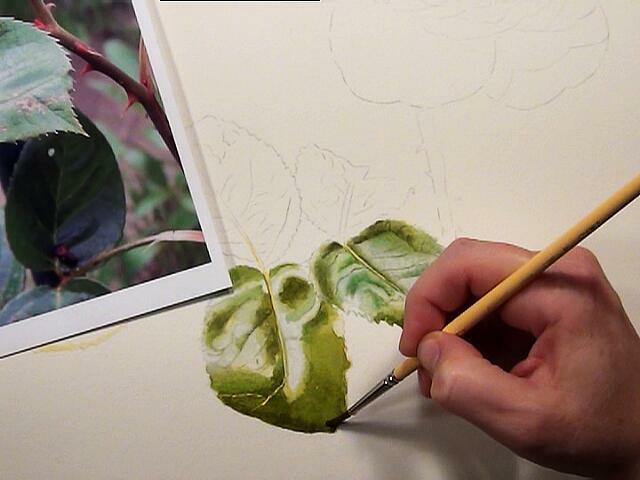 I start with the underpaintings for the warm and cool areas and then adds the greens to make the leaves looking real. This painting instruction is only about leaves. All leaves displayed below are painted and explained . 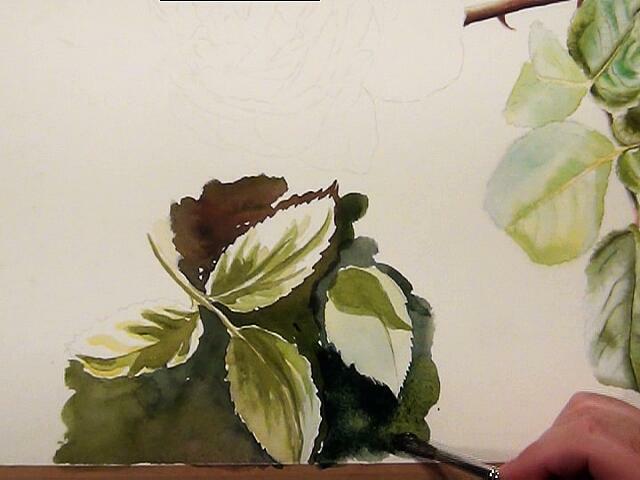 As a Bonus study I show you how to paint rose stems with thorns. I hold nothing back and explain what I do and why. Learn to paint with me and create stunning leaves by yourself as the perfect addition to your flower paintings. 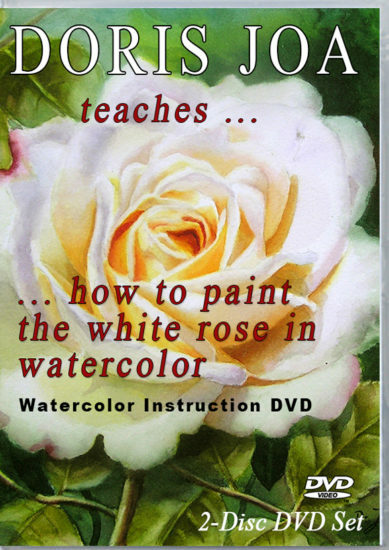 It is extremly easy to follow my Watercolor painting Instruction DVD. I use the common watercolor techniques, so there is no need to learn any new method and to struggle with this. The focus of the camera is always on the painting so you can follow easily what I do and I always explain each step and especially why. 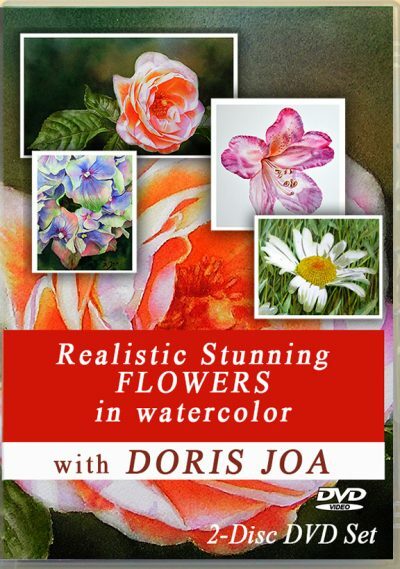 As a special BONUS you will find another lesson about how to paint different rose stems with thorns. to create the lights, midtones and darks. With all this knowledge you will know how to paint the different textures of the leaves you want to paint in future. It is all about light, midtones and darks. You then know how to create shiny leaves, leathered leaves, soft leaves, veins, dark and light areas. images of the finished watercolour leaves studies. 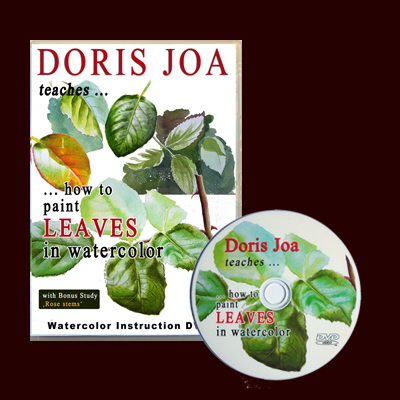 Doris has written down some important notes about how to paint the leaves, which you can print out or read on your computer, smartphone or tablet. 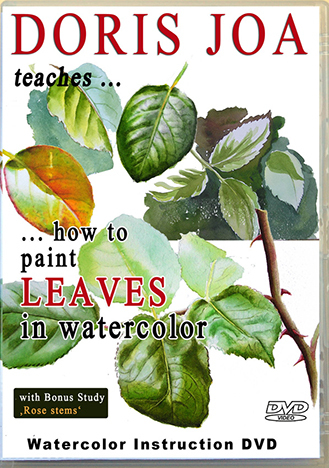 With all this reference material and the instruction on the DVD / in the video you will learn in a short time how to paint leaves. Online Video means that you can watch the video immediately after your purchase. You will get a file with a password to view the video online. Downloads are not offered. But the video is there for you 24 hours a day. You can watch in on your tablet, smartphone or computer – when ever you want. Shipping costs: $8 USD worldwide – Shipping time: The DVD(s) are going to be shipped within 24 hours after the receipt of payment – with tracking number. The post (DHL) promises a short shipping time worldwide within 5-10 days to USA, Australia, NZ …, but sometimes they need longer time, around 14-20 days. Please be patient as each DVD will arrive. Shipping within Europe is of course much faster. Received your DVD’s Yesterday and I am already half way through them. They are wonderful!! I am learning so much, especially about warm and cool shadows, and the essential underpainting on leaves!! Dear Doris, Your DVD’s arrived late this afternoon much to my pleasant surprise. I thought they would be much later. I watched the one on painting leaves as soon as I got it. It is wonderful. You make everything look so easy. I can’t wait to try your techniques. I mostly do wet in wet, but now I will try wet in dry. Your leaves are simply gorgeous. Thanks again for that wonderful DVD. Can’t wait to view the other one. Do you use cold pressed or hot pressed paper? I’ve invested SO much money in watercolor paints, brushes, paper, and other videos but, I was ready to quit because it was so frustrating. My paintings all looked so flat and lifeless. I couldn’t understand the light, dark, warm, cool. I was on the verge of quitting but, because I had spent so much on the materials and so many years trying I decided to take a chance on one last painting DVD. I decided to start small and go with leaves rather than complex multiple petals of a flower. So glad I did. Small investment, Big reward for me!! You clearly explained the proper colors to mix to achieve the right warm and cool colors to mix to get the varying levels of light or dark. You showed over and over where to apply the right mixes to make the leaf look real. After watching your DVD and following along I am starting to paint realistic leaves! My first attempts, while a bit rough, were better than anything I tried up to this point. Using the colors you suggested, I experimented a bit by adding a tiny bit more or less of one color or another and amazed at how it adds such variety to the leaf! I’m having fun painting because it’s working and my frustration level is going away. Guess I will keep my watercolor paints after all! Ready to tackle the flower video next!